Slack has quite a lot of users that are logged-on to the chat service quite a lot of the time. The enterprise communication app published a little update on its company blog today announcing that the service is still growing pretty rapidly, tripling its daily active users in less than a year and doubling its concurrent users in the past 8 months. Three million users use the app on a daily basis to send chats, images, spreadsheets, gifs, etc. These user numbers continue the upward slope of user growth for the service. After having been rather quiet on the product front for a while, Slack has been hard at work over the past few months adding to its experience. They’ve begun adding voice and video chat capabilities and are now working on making “Sign in with Slack” the enterprise-equivalent of Facebook’s universal Login. The company is currently valued at $3.8 billion after raising another $200 million in funding this past April. 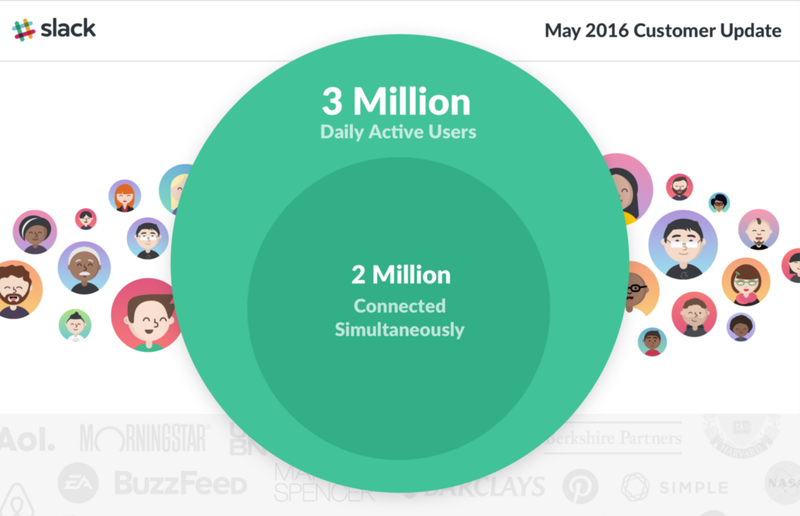 The service has shown it has legs with user growth, but these numbers show that even daily active user may not be a metric relevant enough to show how much users are hopping on Slack.